It's goodnight (or good morning from us). But don't worry, we'll leave you with links to all the rest of our overnight coverage! Here's our favourite picture of the night - Spike Lee jumping for joy right into Samuel L Jackson's arms, as he picked up his first competitive Oscar for adapted screenplay for BlacKkKlansman. We'll have what he's having.Image caption: We'll have what he's having. Broadway legend Carol Channing may have been overlooked in the In Memoriam montage, but it seemed several stars were taking inspiration from her famous catchphrase "raspberries" (from Thoroughly Modern Millie). First there was Olivia Colman's raspberry at production staff who tried to cut her winner's speech short. Then actress Priyanka Chopra and her husband, actor and singer Nick Jonas, got in on the action - blowing raspberries at each other on the red carpet for the Vanity Fair party. Jennifer arrived with partner and former baseball professional, Alex Rodriguez. She was wearing a shimmery shell-like number, while A-Rod went for the traditional tux look. The fall doesn't seem to have affected Rami too much - here he is celebrating at the Governors Ball. The best actor winner fell over after collecting his prize. Hopefully he'll have recovered in time to celebrate. While capes were one of the key style trends on the pre-Oscars red carpet, it was all about trains at the Vanity Fair after-party. Actor Hugh Laurie and Olivia Colman's Peep Show co-star David Mitchell have congratulated her on her best actress win, for playing Queen Anne in The Favourite. Glenn Close (The Wife) lost out to Olivia Colman in the best actress category. And Amy Adams (Vice) was up for best supporting actress, the award that went to Regina King for If Beale Street Could Talk. X-Men star James McAvoy proves you're never too famous to ask your well-known contemporaries to sign your shirt - in red pen. The US actress made her first appearance since announcing her MS diagnosis, at the Vanity Fair party. Broadway star Billy Porter, in a tuxedo-themed gown that's still provoking comment on social media, hours after it first made a splash on the red carpet. Lady Gaga has been an absolute gift this awards season, brightening up the race as only she can. All eyes were on her as she took to the stage halfway through the ceremony, kindly bringing her co-star Bradley Cooper with her for a live performance of Shallow, their duet from A Star Is Born. With Cooper snubbed in the best director category and an outsider in the best actor category, this was a rare opportunity in the night for him to stretch his legs. Gaga was back on stage later in the evening to accept the Oscar for best song. "Thank you to every single person in this room. Bradley, there is not a single person on the planet who could've sung this song with me but you, thank you for believing in us." She added: "I've worked hard for a long time, It's not about winning, what it's about is not giving up, if you have a dream, fight for it." Speaking backstage, Gaga said: "For this film, there were many songs written, but there was one song that was written with true, true friends of mine, who know everything about me, the ups and the downs." She accepted the prize alongside her three co-writers, Andrew Wyatt, Anthony Rossomando, and Mark Ronson. Cooper did not technically win this prize either as he isn't credited as a writer on the song. 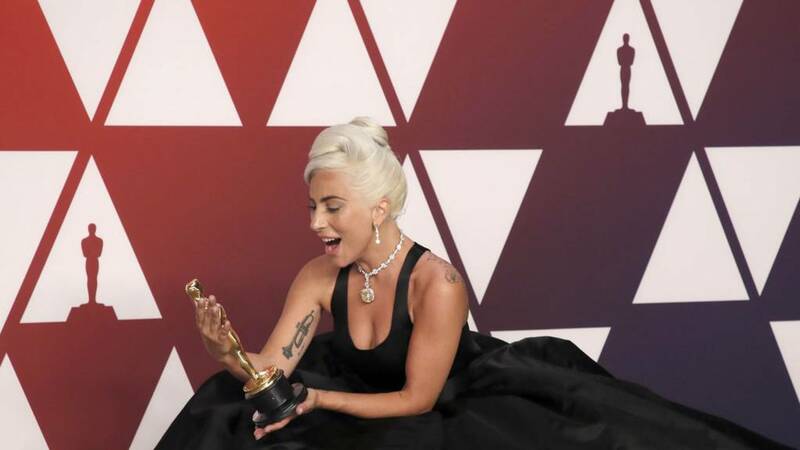 Asked to expand on the struggles she's had to overcome on her journey to Oscar glory, Gaga replies: "I was so determined to live my dreams, and yet there was so much in the way. "There were so many things I did not anticipate, that broke me, that tortured me, that traumatised me. And I think sometimes that people think that it comes easy to us, that we show up, and we have our suits on, and it's all okay. "But the truth is this is very, very hard work." Love was all around as celebrity couples hit the Vanity Fair post-Oscars party. Singer John Legend and his wife, model Chrissy Teigen, met in 2007.Image caption: Singer John Legend and his wife, model Chrissy Teigen, met in 2007. Liam Hemsworth and Miley Cyrus tied the knot in December.Image caption: Liam Hemsworth and Miley Cyrus tied the knot in December. Actresses Sarah Paulson and partner Holland Taylor have been together since 2015.Image caption: Actresses Sarah Paulson and partner Holland Taylor have been together since 2015. Singer Joe Jonas and Game of Thrones star Sophie Turner are planning their wedding.Image caption: Singer Joe Jonas and Game of Thrones star Sophie Turner are planning their wedding. Backstage in the press room, best actor winner Rami Malek is quick to acknowledge the bad reviews Bohemian Rhapsody received. Before anyone had even asked a question, he says to journalists: "I don't think, critically, the decision on this film was unanimous, but I do appreciate everything you guys had to write. As a kid, I read criticism of film and I learned a lot from it, so thank you." If there was ever a way to immediately endear yourself to the press, this is it. "I have to say, being on that stage, I don't know how I looked, but I never thought this would happen in my life," he says of his win. "The one thing I can say about this is, as an actor, there are so many of us who only dream of one thing, and perhaps it's not this, it's just getting a job. "So the fact that I have this in my hand right now, is beyond any expectation that perhaps myself or my family could have ever had." A huge gasp of surprise went up backstage when Olivia Colman was announced as the winner of best actress. "This is hilarious, I've got an Oscar," Colman said through tears and genuine surprise, reflecting the reaction of the audience. "Glenn Close, you are my idol, and this is not how I wanted it to be." Close had been widely tipped to win for her role in The Wife. Her loss means that she has now been nominated seven times without winning. "I could not tell you what I'm feeling. I don't know what to do with myself at the moment," Colman says backstage. How much of her acceptance speech was prepared? "None of it," replies Colman - an entirely believable answer. "And I've just been told I completely forgot Melissa and Yalitza, but it's not an everyday occurrence, so I don't know how anyone is composed and remembers everything." Asked where she will keep her Oscar, Colman replies: "In bed with me. Between me and my husband. He doesn't know yet. He won't mind." Black Panther winners make Academy Awards history. Spike Lee on Green Book win: "The ref made a bad call"
When Julia Roberts announced Green Book had won best film, BlacKkKlansman director Lee was seen to leave his seat. Many interpreted this as his way of showing he disapproved of the decision. When asked about it backstage, Lee said he thought he was court side at Madison Square Garden and "the ref made a bad call". The star of The Favourite becomes the first British woman to win best actress in 10 years. Find out who's got their hands on the golden statuettes at this year's Academy Awards. The stars were out in full force on the red carpet for the 91st Academy Awards. The ceremony saw Black Panther make history and a surprise win for Green Book. It was the first Academy Awards to go ahead without a host since 1989 - and it was an unqualified success.